Head to Target for Easter Shopping! Are you ready for Easter this weekend? If you are still scrambling to fill Easter baskets, bake Easter goodies or get ready for your Easter guests, then let Target help you! This season, Target’s Easter products range from jars of jelly beans to edible grass to “egg snatchers” to this super cute Flower Pot Cupcake Bake Kit! I received some really fun Spring and Easter products! 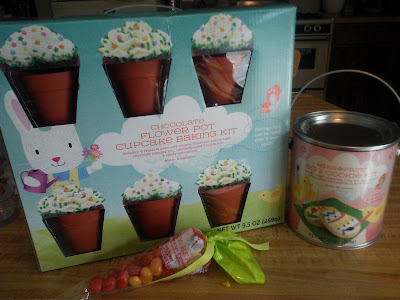 I love the Flower Pot Cupcake Baking Kit because the cute flower pot silicone baking cups are re-usable and will be perfect not only for Easter, but for my daughter's Ladybug themed birthday party this weekend! The Easter Egg Cookies pail has everything you need to make super cute Easter egg themed cookies with your children! And the cute carrot shaped bag of jellybeans is perfect for adding to any Easter basket! They are also offering this Spring Chick Cake Pop Kit! These cake pops will not only be delicious but super cute too! So this Easter, make sure to head over to Target and take a little stress off yourself! They offer such cute products and baking mixes that will reduce the work and creativity needed this Easter! Buy It: You can purchase all of these Easter themed products at your local Target store.